The department of Vitreo - Retina deals with ocular conditions affecting the posterior segment of the eye. 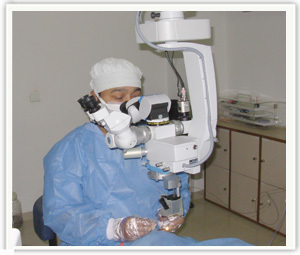 Besides indirect Ophthalmoscopy and slit lamp biomicroscopy, specialized equipments like B-scan ultrasonography UBM (Ultrasound Biomicroscopy) and Digital fundus fluorescien angiography (FFA) aid in diagnosis and treatment of complex vitreo-retinal diseases.
. Fundus Fluorescein Angiography is a diagnostic procedure where a dye is injected into a vein and sets of digital photographs are taken to display the blood vessels of the retina. It shows any abnormal blood vessels and any leaking spots causing retinal diseases. Optical Coherence Tomography (OCT): -The thickness of the retina can be accurately measured by OCT. This recently developed instrument allows for topographical analysis of irregularities in contour of the retinal surface as well as painless measurement of the retinal thickness down to a small fraction of a millimeter. OCT has become an important tool for the diagnosis and for planning for the line of treatment and follow ups in diseases like diabetic retinopathy, age related macular degeneration, Retinal Venous Occlusion. Photo Dynamic Therapy: -Photodynamic therapy is a special form of Laser treatment for Choroidal Neovascular Membrane (CNVM) due to various causes like – Age related Macular Degeneration (AMD), High Myopia, idiopathic and post inflammatory.This therapy is based on stimulation / activation of a photosensitive dye by exposure to a light (laser) of specific wavelength, which then closes the new vessels. 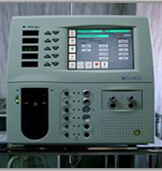 Retinal lasers are performed using green laser (iris medical) for Retinal Holes or tears, Diabetic Retinopathy, Retinal Venous Occlusion, Eales Disease, and Selected Cases of Central Serous Retinopathy. Uveitis is condition in which there is inflammation of the ocular coats. With the help of FFA and laboratory facilities, our uvea service can not only diagnose the ocular disorder but also the systemic disease associated with it. The treatment of uveitis can be a challenge due to recurrent nature of the disease. Ocular trauma leading to globe rupture, corneal tear, scleral, lid injury or intraocular foreign body is managed on emergency basis. The department has state of the art surgical equipments in operation theatre like Moller- Wedel microscope and CONSTELLATION , latest machine for microincision vitrectomy.